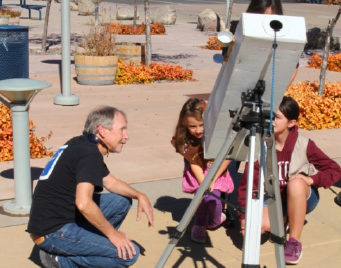 The Astronomical Society of Nevada does public star gazing, presentations on Astronomy and Science and works with local schools and other organizations, like the Boy Scouts and Girl Scouts, to educate children on the wonders of the sky. In addition, we help each other learn more about the different aspects of Astronomy and participate as a group in celestial events. There is something for everyone. Teachers of young learners will tell you, children love learning about outer space, the planets, what space travel is like. Kids easily relate to the wonder we all share when follow the International Space Station across the sky with depth of the Milky Way behind. From a very early age, parents can inspire their kids to become junior astronomers. It can be as simple as finding a dark sky and pointing upwards...or painting the ceiling in their bedroom. There are many excellent books on astronomy for kids, too. The ASN was formed in 1934 with education in mind. Find out how to become a member.